South Africa is at a critical conjuncture as communities facing the detrimental impacts of water and climate crises collide with a neoliberal state propelled by international financial institutions to facilitate corporate water grabs. These water grabs have taken various forms from the privatization of water and sanitation services to neoliberal “conservation” strategies aimed at promoting the financialization of freshwater resources. 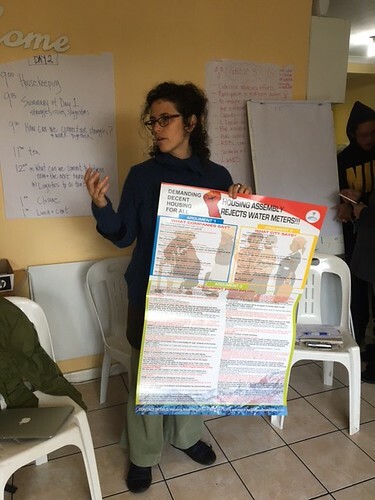 On September 18 and 19, the African Water Commons Collective, the Surplus People Project, Tshintsha Amakhaya and the Blue Planet Project hosted a national roundtable on water justice in Cape Town. The event brought together frontline activists, academics and representatives of 34 South African organizations. The goal was to collectively map out a water justice strategy uniting rural and urban water struggles in South Africa. Held in Cape Town, the event sought to draw from the experiences and lessons learned through the Cape Town water crisis in order to develop concrete alternatives that will form the basis of a people-driven plan for a national water justice strategy that would put the interests of traditionally marginalized people at the forefront. Many representatives spoke of water injustice as being emblematic of the ongoing legacy of apartheid in South Africa. Ronald Wesso of the Casual Worker Advice Office, a workers’ rights coalition based in Gauteng, argued that water is central to the struggle for a decent life. He argued that right to land and right to vote campaigns seeking retribution and redistribution in the post-apartheid era have failed to include water in their vision. A spokesperson for the Thembalihle Crisis Committee echoed this concern noting that the people of Thembalihle (south of Johannesburg) have been living in informal settlements for the past 30 years without decent housing and access to public services. “Members of our community are not enjoying the fruits of hard won-democracy” he argued. Kenneth Matlawe, chairperson of the Cape Town-based Housing Assembly and a resident of the Guguletu informal settlement concurred that the ever-increasing lack of decent housing deprives people of their right to live in dignity. A fellow housing rights activist, Nokuzola Bulana, described the city of Cape Town’s failure to deal with faulty infrastructure resulting in raw sewerage leaks in areas where families live in close proximity to each other in her informal settlement of Khayelitsha. Greg Ruiters, of the Municipal Services Project at the University of Western Cape argued that communities of colour who fought against the injustices of apartheid are still having to face the humiliation of carrying water and using buckets as toilets. Along the same vein, Thabang Ngcozela a member of the Eastern Cape Water Caucus explained out that existing water rights were allocated during the apartheid era. This has meant that Black farmers who have gained access to land in the post-apartheid era are still struggling to use this land productively because they are denied access to water. Post-apartheid governments have done little to change this reality. In addition, others noted that rural communities are now further threatened by the growth of extractivism and large-scale commercial farming in South Africa. On the second day, the discussion focused on movement strategies and ways to move forward collectively. Faeza Meyer and Ebrahiem Fourie from the Cape Town-based African Water Commons Collective (AWCC) spoke about their organization’s support to community members fighting the city’s water management devices – a scheme through which the city has been shutting off water to poor households after providing a grossly inadequate daily minimum. The AWCC, one of the co-hosts of the roundtable, is currently meeting with community-based activists around the city to learn about how the politics of drought management have impacted people living in vulnerable housing conditions and sharing strategies on how to fight back. 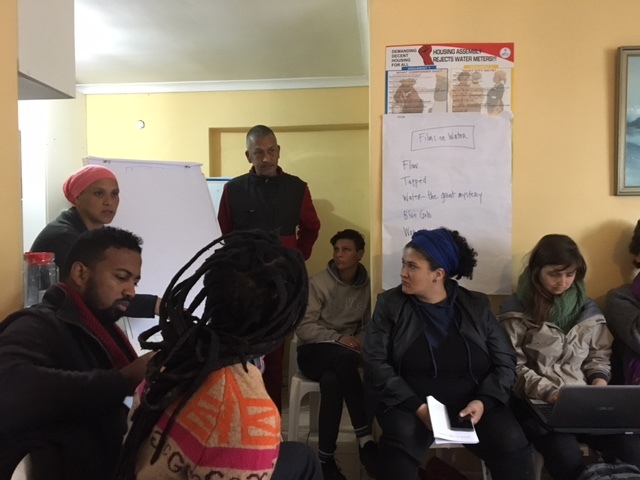 The roundtable provided an opportunity for the group to share information about water action committees that are being set up in communities around Cape Town. Photo: Koni is holding up a poster made by the Housing Assembly and the Blue Planet Project. Among the strategies put forward, researchers and NGO representatives offered to help create a survey that would enable groups like the AWCC who are engaging with frontline communities to gather information strategically in order to mobilize and effect political change. Other strategies included identifying key local struggles and points of convergence that would enable different groups to come together and intervene collectively. A steering committee was struck up that currently includes the Surplus People Project, the Housing Assembly, Tshintsha Amakhaya, the Environmental Monitoring Group, the South African Water Caucus, the African Water Commons Collective and the Blue Planet Project. Together the committee will plan for the following roundtable discussions and facilitate communication and follow-up work among the participating organizations. The end goals of the series of meetings to take place between September 2018 and June 2019 are to bolster a national water justice movement and build a national people-centered water justice strategy.